Thanks to David Cohen, MD, Herzliyah Medical Center, Israel, for contributing this case. To contribute a Case of the Week, follow the guidelines on our Case of the Week page. 1) In April 2010, we had record traffic of 274,366 visits (8.5 million �hits�). Thanks for your support! 2) How can you tell what fellowship openings have recently been added? We now have a link on the main fellowships page (sorted by Specialty) at the top that lists fellowships by date added, similar to the feature on the Jobs page. A 29 year old woman presented with a soft, friable, mildly tender subcutaneous occipital mass, which was excised. 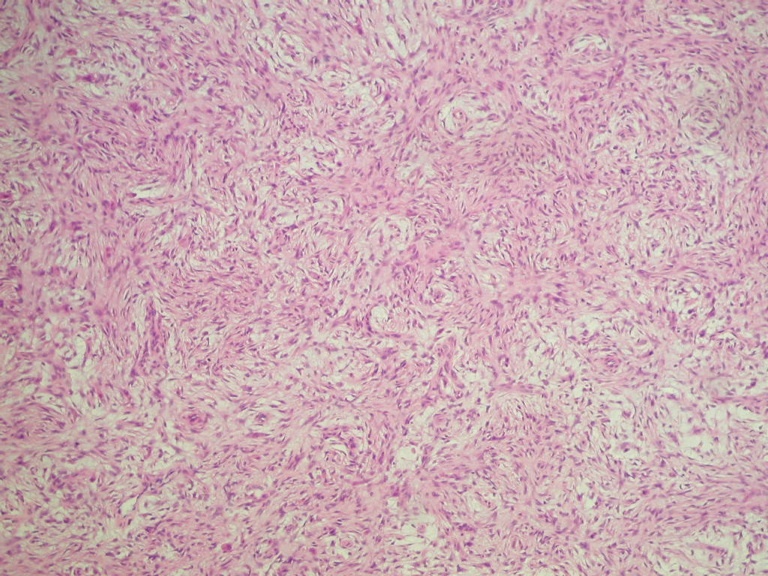 It was 3 x 2 cm, grey-tan, solid and nodular. 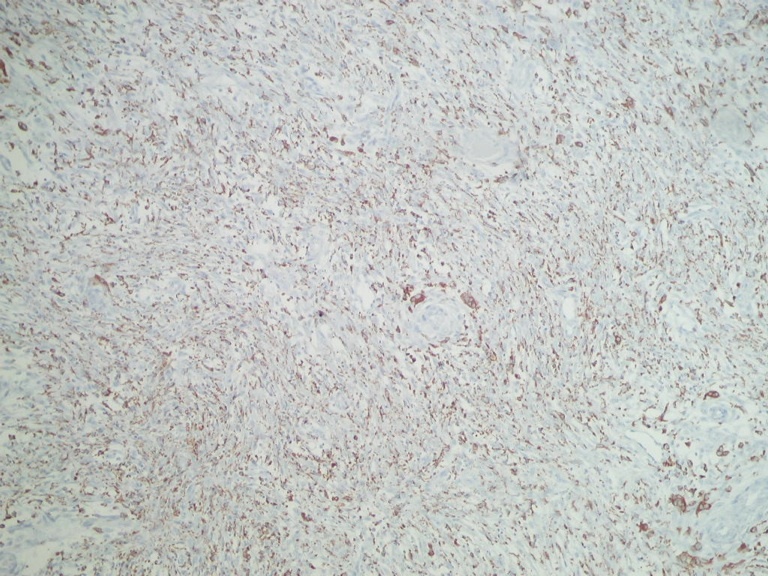 The tumor cells were negative for keratin, S100, MelanA, HMB45 and CD34. 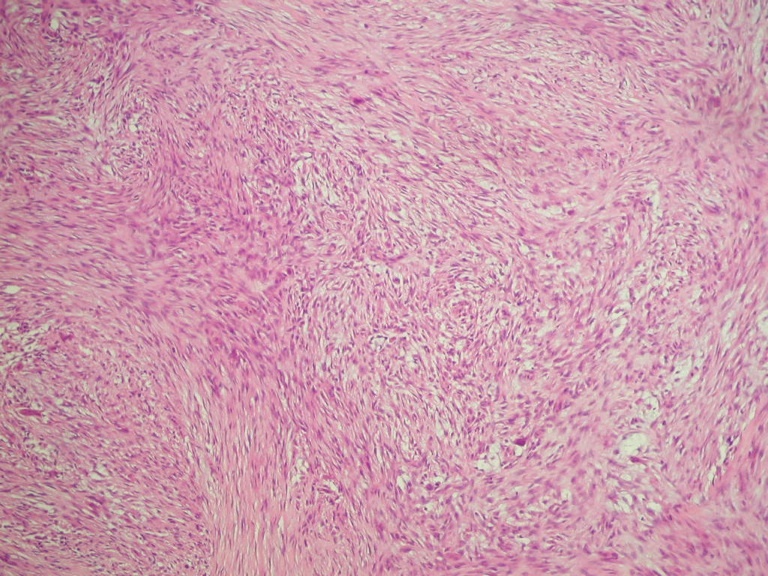 The frozen section resembled a schwannoma, with cellular palisading spindled areas mixed with hypocellular, more myxoid areas. Permanent sections show a poorly circumscribed and non-encapsulated mass. The cellular areas are composed of spindle-shaped, �wavy� cells, often in clusters in a plexiform pattern. 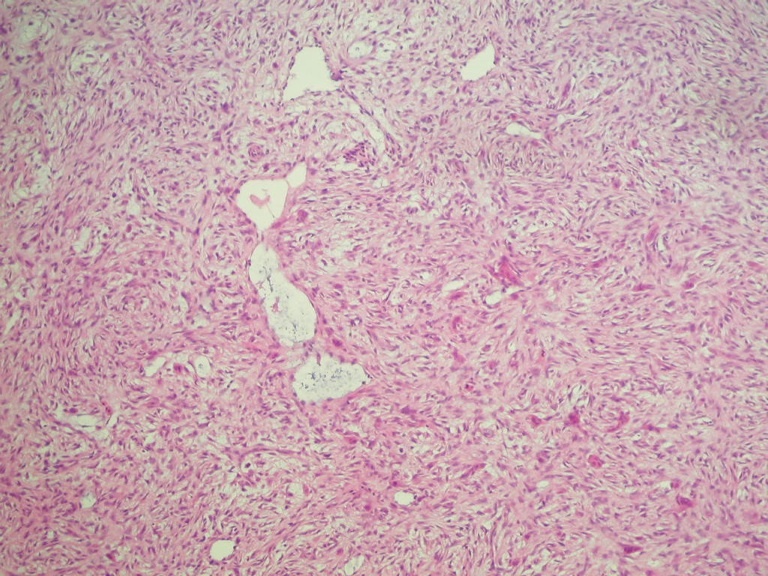 Interspersed between the cellular areas are plump cells with abundant eosinophilic cytoplasm but no atypia, consistent with histiocytes, including many multinucleated forms. 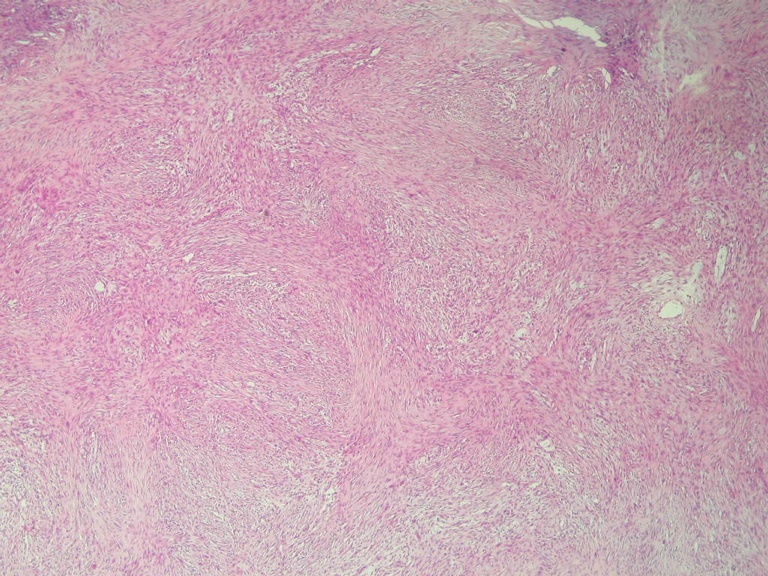 There are rare mitotic figures, but no necrosis. 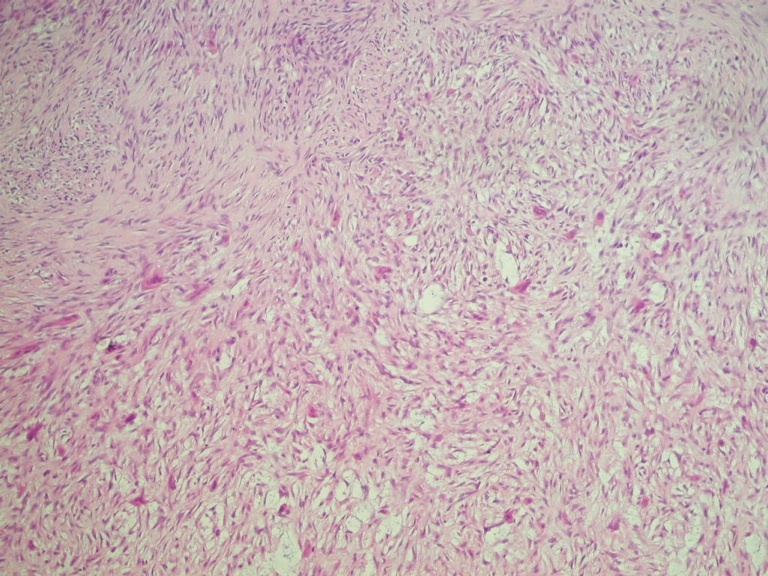 Plexiform fibrohistiocytic tumor is a dermal or subcutaneous, plexiform or multinodular proliferation of fibrohistiocytic cells and osteoclast-like giant cells with a chronic inflammatory infiltrate. It was first described in 1988 (Am J Surg Pathol 1988;12:818). It usually affects children and young adults, and 80% of patients are female. It presents as a small, slow growing dermal or subcutaneous mass, often affecting the upper extremity (65%) or lower extremity (27%). Grossly, it appears as a multinodular, poorly circumscribed, firm mass up to 3 cm. 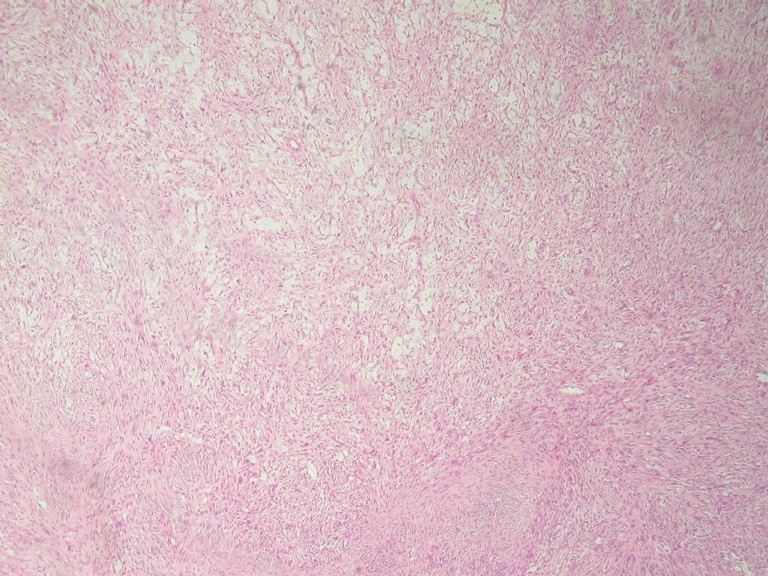 Histologic examination shows a deep dermal or subcutaneous tumor with a ray like extension into skeletal muscle or adipose tissue. The overlying epidermis and dermis is usually normal. 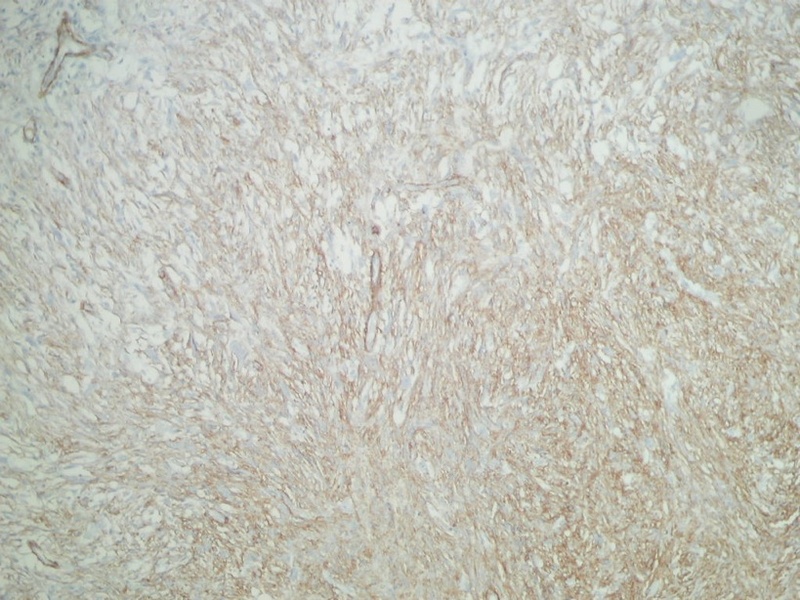 The tumor cells and stroma are as described above. Vessels are prominent and dilated. There is often hemorrhage and hemosiderin and occasional vascular invasion. As in the present case, the spindle cells are immunoreactive for vimentin and smooth muscle actin. The giant cells and mononuclear histiocyte-like cells are positive for CD68. These cells do not stain for S100, keratin, CD34, CD45, Factor VIII or desmin.